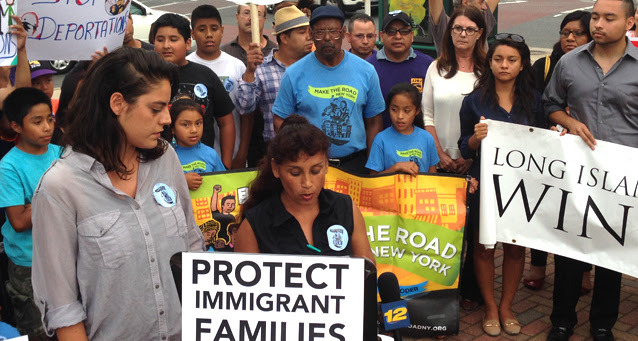 Long Island members like Inocencia Muñoz (center) have stood up for immigrant rights and denounced Secure Communities. Great news! Suffolk County, Long Island — where 1 in 6 residents are immigrants — will no longer be cooperating with Immigration and Customs Enforcement detainer requests in its jails. Under Suffolk County Sheriff Vincent DeMarco’s new policy, residents no longer risk getting arrested and potentially deported by ICE’s dragnet enforcement simply for reporting a crime or coming into contact with local law enforcement. This marks a critical step forward for public safety on Long Island. Nationwide, the misnamed federal program, “Secure Communities,” requests that local law enforcement hold immigrants (at local taxpayer expense) for interrogation by ICE — even when the person in question is found innocent of any wrongdoing. In the past, Suffolk has been a hotbed of anti-immigrant politics and hate crimes, and Secure Communities made immigrants even more distrustful and fearful of law enforcement. When victims and witnesses to crimes are afraid to go to the police for help, this makes our communities less safe. Outside of New York City, Suffolk has been the state’s top deporting county, having made 15% of New York’s total deportations since Secure Communities started in 2011. But Sheriff DeMarco’s new policy will help Suffolk turn the page: jails will no longer honor any ICE requests to hold residents for additional time without a judicial warrant. This victory is one of many by Make the Road New York and other organizations nationally in which cities and smaller localities have stood up to misguided federal policy and led the way for fairness and justice for immigrant communities. Make the Road members Luba and her mother commend Sheriff DeMarco’s leadership. We thank our members and our partners, Long Island Civic Engagement Table, New York Civil Liberties Union, Center for Popular Democracy, and the many others who made this victory possible.